I was working through a pile at my desk yesterday and came across sales material for a Wine Whisk that I had picked up at the San Francisco Gift Market. Remember thinking then... what will they invent next to sell to wine lovers or folks looking for the next gadget to buy for wine loving friends. The Wine Whisk booth at the gift market was packed. Molly, Lisa and I inched our way to the front and were totally speechless. There were all these glasses of wine being "whisked" like scrambled eggs. We backed out of the crowd and burst into laughter. All I could think was... Benoit will kill us if we bought this gadget for the winery. 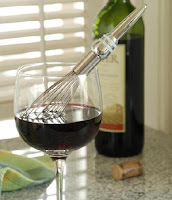 Whisking is not in his top three ways to aerate his beautiful wines. But, in our time starved lives, maybe just maybe, this whisk might be a good thing. So I bought one and never told Molly or Lisa. I knew they would make fun of me. Also, should have done a little research on-line before my test of this product... opened a really good bottle of wine and poured it into one of my crystal glasses. I got a little too energetic "trying to beat my wine into a frothy goodness". (Whisks are naturally meant for beating not for stirring and it didn't come with a warning.) It didn't take long... I broke my glass and spent the next 20 minutes cleaning up Syrah. The force of the words that passed my lips was aeration enough. Since then I found the "Nerd Approved" website, the source for preposterous products. Their write-up on the whisk warns the user from being too zealous! 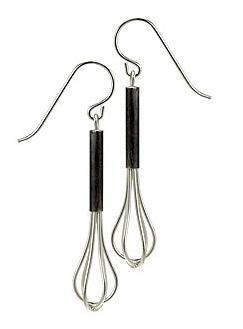 And furthermore, the website also recommended a coordinated look... a link to purchase "whisk earrings". Now my wine loving friends, you can have it all. Perfect holiday gifts or NOT. Joy and Benoit team up again for another fabulous wine dinner featuring Italian Cuisine and Wines on Saturday, November 14 at 5:30 p.m. This is the same weekend as the Olympic Peninsula Wineries Autumn Wine Tour . We have something quite special in store for our guests. In talking to Benoit about the dinner, I found out that if Joy had a choice of what to eat and cook, it would be Italian with lots of pasta. Most of her training has been in Italian cuisine in New York and Seattle. Joy worked under Chef Walter Piscano for 7 years at one of my favorite restaurants in Seattle, Tulio Restorante, located in the Hotel Vintage Park. Chef Walter is known for his boldly flavored, sophisticated Italian dishes. Throughout the dinner Joy and Benoit will share stories about their trip to Italy in 2007 to VinItaly, the Italian wine conference, and their dinner at Allegrini winery. Some of the wines served will be from this famed winery. In addition to the fabulous menu below, Joy will talk about the regional menus and dishes they ate in Verona, Rome and Florence along with a special story about working at a goat farm in Tuscany. Joy’s and Benoit’s dinners are memorable. 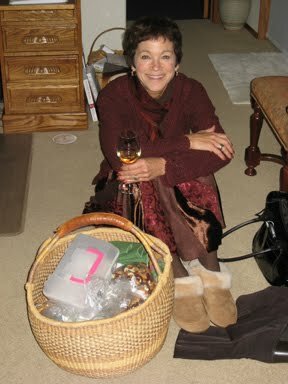 The last was the “Joy and Julia” dinner in our cellar at Olympic Cellars. I’ve finally posted the videos to Olympic Cellars YouTube Channel . Call Joy’s Wine Bistro for reservations. 360-452-9449. Dinner is $55 per person. Today on the Peninsula it is intermittently pouring down rain with brief outbursts of sunshine and rainbows. When I dropped off my cleaning the lady at the counter said, "Enjoy the Liquid Sunshine!" Hadn't heard that phase before but loved it along with her friendly smile. Of course, for me, my mind eventually gets to wine. "Sunshine in a Glass" is my favorite description for our Lemberger Rosé, a.k.a. Rosé the Riveter. The wine is fresh, crisp and doesn't over power food. Benoit, my French foodie and our winemaker, thinks that wine made from Lemberger grapes is one of the best food pairing wines. Being French, he always has a small glass of wine when he takes lunch and it's always Lemberger. During the holidays we make lots of different side dishes and desserts, usually our favorites from handed-down family recipes. The highlight of the meal is not the food but "gathering" with those we love. I like to pick wines that enhance and not crowd out all the different flavors, especially Aunt Edna's Green Been Casserole with French Fried Onions or better yet... corn pudding! Now don't laugh, we all have those handed down family recipes. It wouldn't be the same without the tradition! Harvest is complete and bottling is next Tuesday. Then we’re ready to celebrate and share the bounty during our annual Passport Wine Tour event on Saturday and Sunday, November 14-15 from 11 a.m. to 5 p.m. This year’s event will not only focus on our wine and new releases but also our local Olympic Coast Cuisine. 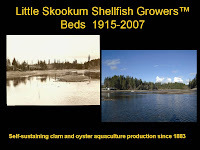 We are partnering with Peter Becker, CEO of Little Skookum Shellfish Growers, a sustainable oyster and clam aquaculture since 1883, Bell Street Bakery and Nash’s Organic Farm. The Olympic Peninsula Wineries is your host for Passport Wine Tour. This year it is B.Y.O.G. (Bring your own glass which will be fun to see your favorite glass and hear the story behind the glass). Tickets are $25 which will waive the tasting fees at all 6 wineries or you can opt to just pay the $5 tasting fees at the wineries you visit. Your choice! At Olympic Cellars on Saturday and Sunday: Tasting room is open 11 a.m. to 5 p.m. for event and tasting of a full selection of our award winning wines. Saturday, Nov. 14, from 12-4 p.m. Outside on the Patio in our “heated venue”…. The Olympic Peninsula Loop Culinary Tourism Association (Olympic Culinary Loop) exists to define, promote and celebrate the Olympic Peninsula’s unique culinary experience, educate consumers, and ultimately establish the region as a niche destination to enhance economic development and the region’s tourism product. Olympic Coast Cuisine reflects the diverse microclimates, coastal proximity and Native American heritage that characterize the Olympic Peninsula. The combination of sustainable locally-grown and foraged fruits, vegetables, herbs and berries, locally hunted game, bountiful local sea fare, and handcrafted local wines offers farm to table experiences that instill a unique sense of place. Prepared with reverence to the local history and culture, fresh Olympic Coast Cuisine is best enjoyed amid the beautiful scenery that surrounds the Olympic Peninsula loop.